Jacksonville Christian Academy (JCA) in Jacksonville, North Carolina, recently won the state soccer championship titles for both boys’ and girls’ soccer. Four Ayusa students attending JCA were part of the championship teams. 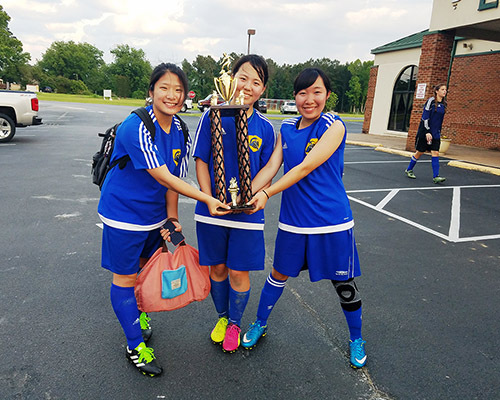 Joanna from Taiwan and Chiaki and Ayaka from Japan were 3 of approximately 20 players on the girls’ soccer team. Chiaki and Ayaka had both played soccer before in Japan, but Joanna had never played before beginning her exchange year in the U.S. Even with the ultimate success of the team, the journey to the championships was not without challenges. Chiaki injured her knee early in the season, which prevented her from playing until the final two games. Despite this setback, she was fully embraced as part of the team and said it was an unforgettable experience. Koshin, also from Japan, played on the boys’ soccer team. He had also never played soccer before coming to the U.S. and didn’t even know the rules. Over the three month season, he worked hard at practice and ultimately became a key player. Just a few days after the girls’ team won the state title, the boys’ team did the same. As the students get ready to return to their home countries, their host families expressed pride in the students and gratitude for the experience. “These kids have worked hard, played hard and have accomplished so much this year. We are honored to have been a part of their lives. They will forever remain in our heart and as a member of our families,” said Sandra, expressing sentiments shared by all the host families in Jacksonville. Jacksonville Christian Academy is already confirmed to welcome several more Japanese Ayusa students in the 2017-18 school year. Ayusa still has students from a wide range of nationalities looking for host families and schools all over the United States. Interested families can learn more about hosting and apply online to start the process.